Vijay fans are badly waiting to know the status update of Mersal title issue. Apparently, today's court proceeding went in favour of Mersal team who is confident of a positive result. The final hearing is on Friday. So Vijay fans and movie buffs need to wait for a couple more days to know the final result. Hema Rukmani from TSL took to her Twitter space to update on the issue, "Good news on Friday. Happy excited #Grateful @ThenandalFilms @MuraliRamasamy4 #TSL100"
DID YOU SPOT THIS DIFFERENCE IN THE MERSAL TELUGU TEASER? Vijay’s big film Mersal had its Telugu teaser releasing today (September 30, 2017). 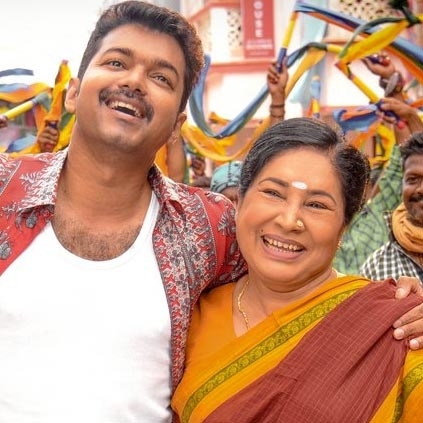 The film is titled as Adirindhi and it has music by AR Rahman with SJ Suryah, Samantha, Kajal Aggarwal, Nithya Menen and Vadivelu as part of the cast. A striking difference has been spotted between the Tamil and Telugu teasers. It is a known fact that, in the Tamil Mersal teaser, MGR’s poster will be seen in the backdrop at the fag end of the teaser. Likewise, in this Telugu version it is to be noted that, NTR’s poster is seen instead of MGR’s poster in this same shot. This has been done to encash the Telugu nativity. Know what Kamal gifted Bigg Boss contestants? "Double Dhamaka" Most anticipated update on Sangamithra! Sundar.C's Kalakalappu 2 starts from today! Breaking: Jai’s next film with his Chennai 28 teammate! Details here! Wow! Vikram's Saamy 2 has a different and interesting title! It is not Saamy 2. Shocking: Actor Balakrishna slaps a fan yet again! People looking for online information on Hema Rukmani, Mersal, Vijay will find this news story useful.